Always use freshly picked broad beans; it is well worth sourcing a good local supplier to get the best possible quality. 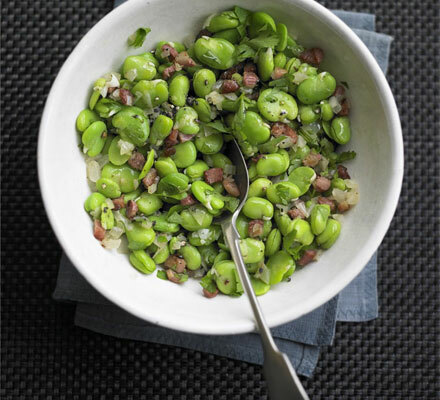 Good quality frozen broad beans are actually an excellent substitute, because they are usually picked and frozen within a two hour window. The best quality dry cured, smoked bacon will ensure the perfect finish to this simple but delicious side dish. Boil or steam the beans 15-20 minutes until tender. Do not add any salt while cooking the beans; it will ruin the texture of the cooked beans, the bacon will be salty enough to season the finished dish. Drain and set aside. Cut the bacon into small pieces. Add a little oil to a hot frying pan and fry the bacon pieces until they start to crisp. Take care not to burn them, but cook them well. Add the beans to the hot frying pan and gently toss the beans to combine the flavours and to heat them through.